King Arthur promised and delivered again: a coffeecake so easy to make that even a cake-challenged as myself can do it without problems. One of the things I loved about this recipe was the fact that I could prepare the cake the day before, stick it in the fridge, and bake next morning. By the time our lab meeting started, the cake was at its peak, barely warm, very moist and tender. Prepare a baking pan (9 x 13 inch) by lightly greasing it with butter. In a large mixing bowl, beat together the softened butter, sugars, baking powder, baking soda, salt, cinnamon, and vanilla extract, mixing until smooth. If you are starting from very cold butter, place it in the microwave for 20 seconds, and proceed with the recipe, it will be perfect to mix with the dry ingredients. Add the eggs one at a time, beating well after each addition. Add the flour and the yogurt (one third at a time, alternating flour and yogurt), stirring to combine after each addition. Spoon the batter into the prepared pan. 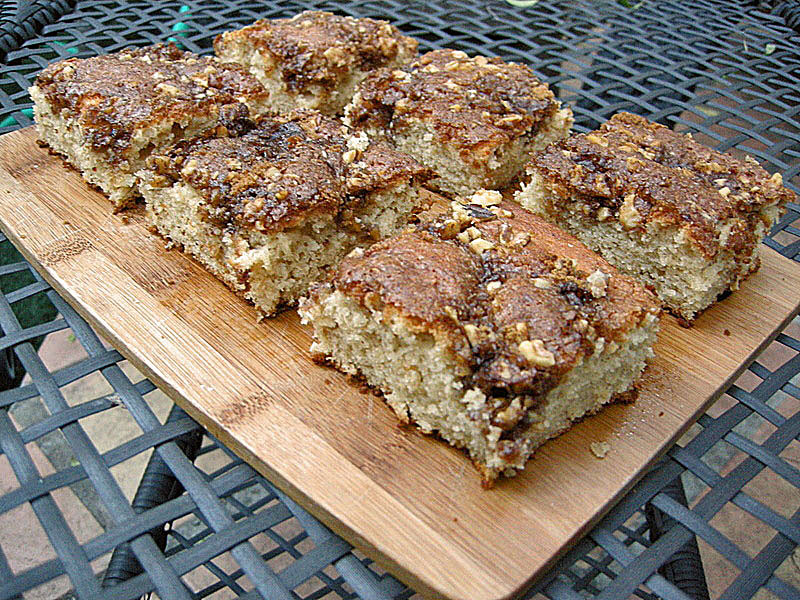 Make the topping by combining the brown sugar, nuts, and ground cinnamon in a small bowl, stirring to combine. Sprinkle the topping over the batter in the pan, cover it with plastic wrap, and refrigerate overnight. Next morning, take the cake out of the refrigerator, remove the plastic wrap, and bake it in a 350 F oven for 40 to 45 minutes, until golden brown on top, and a toothpick inserted in the center of the cake comes out clean. Cool it briefly before serving. Comments: The original recipe called for a bit more brown sugar in the topping (3/4 instead of 1/2 cup), and also the optional addition of 1 full cup of chips (chocolate, butterscotch, or cinnamon). I am glad I reduced the amount of brown sugar (and omitted the chips) because the cake was at the limit of my tolerance for sweetness. If you have a real sweet tooth, go for the kill and follow the recipe as published. I adore cakes with crumble topping! It looks delicious, Sally, you have very lucky lab colleagues! And I love how you make it the night before, ready to be baked fresh to take into work that day! I like KAF. Solid recipes, and I love their Whole Grain Baking book. The thought of assembling the cake the night before and baking it in the morning sounds so great! The nuts in the topping sound great too. I think I need to spend more time on that site. @Sheri: I have that book in my wish list at amazon.com – maybe once I go back home I’ll buy it. Seems great. @Lisa: that site is one of my favorites, particularly because folks give input in how the recipe worked for them, and the people at King Arthur always reply to questions. Great source of info indeed….